Timothy Egan's book The Worst Hard Time is one that was not on my radar at all. But it was available for audio download immediately, and the subject matter seemed very relevant to me, based on current circumstances. Most of the United States is in the midst of a major drought. We're also still suffering from the worst recession since the Great Depression and are committing acts that are drastically changing our planet. Reading about the Dust Bowl in some ways made me more philosophical about the whole thing - these things happen in cycles, and there's nothing we can do to stop them. But it also made me so sad. It seems like there are so many quaint phrases and promises like "Never forget" about horrible things that have happened in the past but people, inevitably, do forget because collective memory can only last for a few generations, and then we make the same mistakes all over again. 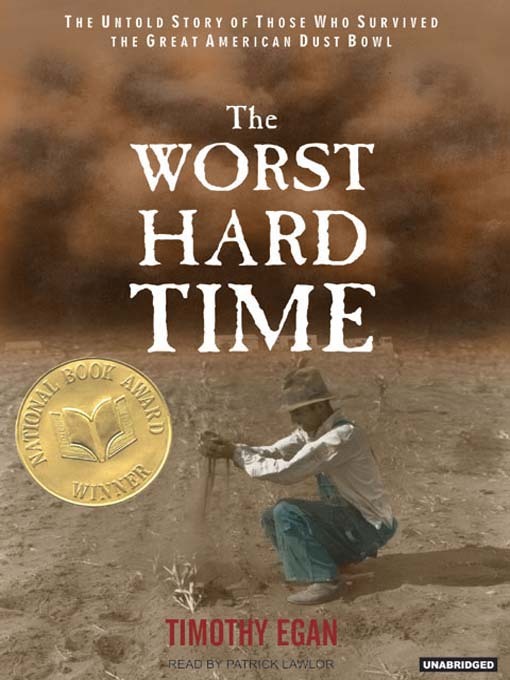 The Worst Hard Time is about ground zero for the Dust Bowl, Cimarron County, Oklahoma. There, people uprooted the prairie grass and killed the bison to make way for cultivated farms and cattle. Within a few years, this plan failed miserably. There was an epic drought that created horrible dust storms (see cover picture above), giving people and animals dust pneumonia and bankrupting whole communities. It follows a few of these families through the hope and rush of the boom time, when they all came south to buy cheap land and settle down as gentlemen farmers. And then, so quickly, those dreams turned literally to dust. 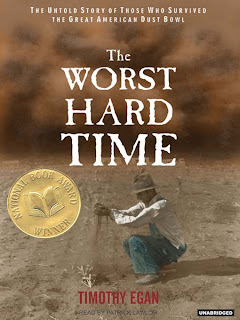 I listened to the audiobook version of The Worst Hard Time, and I think this had a pretty big impact on my impression of the book. The narrator, Patrick Lawlor, had the gravely tone of voice I often associate with PBS American Experience narrators. He told the story as though he had lived through the dusters. I appreciated this as it brought the stories to light much more. But I didn't like the voices that Lawlor gave to the people quoted in the book. The men invariably had southern drawls (even those who were not originally from Oklahoma) and the women. Ugh. He made all the women sound high-pitched and whiny, which bothered me a lot. I also thought that this book got very repetitive in the audiobook version. It seemed like every half hour, there would be another dust storm that came and ruined everything. I understand that they happened very frequently, but I don't think I needed to hear about every single one. I preferred reading about the people and how they made do with so little, the sense of community that came up of people helping each other, how inventive the women got with recipes for their families and farm animals. While I know the Dust Bowl was a terrible and important part of our history, I just wish there had been more in this book to lighten the load for brief moments. Overall, this was an enlightening read about a phenomenon I wasn't very familiar with previously. I really enjoyed the first half but got much more distracted in the second. Still, it was good to read about so many people who lived through so much. Another good one about the Dust Bowl is OUT OF THE DUST by Karen Hesse. It's a verse novel, but it's pretty darn effective. And the dust storms happen frequently, but she always manages to show the different effects the storms have. You should check it out if those stories interest you. A book in verse! Been a while since I read one of those. I will have to check out Akilah's recommendation. I'm sorry The Worst Hard Time wasn't better for you. It does seem like a fitting novel given what's going on today. Your comment about everything happening in cycles reminded me of a lecture I attended in college where the speaker said much the same thing. His entire presentation was about how history is cyclical. The Worst Hard Time is non-fiction, actually, not a novel. Maybe it would have worked better in a more personalized voice. But it just didn't work for me. I think it may be audiobooks, though... I have so much trouble with them if I am not immediately grabbed! Hm, interesting -- I love the era but am not totally grabbed by this one -- and I haaaate audiobook narrators that can't do women well. In this case, it sounds like the narrator was an impediment to enjoying the book, and though I do have a good friend who was born and raised in Oklahoma, I think that if I choose to read this one, it will be in print. And I ask you: why do all the scenes about the dust storms have to be thrown in over and over again. I totally get your annoyance with this! Haha, maybe there were ways of differentiating between them but I certainly couldn't tell.. I hadn't heard of this period, it sounds scary, though very interesting to read about, and I can see why you call it relevant. I suppose the audio could only do so much about the story but putting on bad voices isn't a good idea. No, especially not when they are high-pitched and whiny, while all the men are gritty and strong. Super-annoying. I'm currently reading this for our city's Big Read. In fact, the author is coming to the library tonight for a presentation! Wahoo. Should be really interesting. I'm excited. Yes, I think the author has a LOT of good stories up his sleeve that he probably didn't have place for in the book - hope it was fantastic! This sounds fascinating, though I understand what you mean about needing something to lighten the burden from time to time. Wow, I'm sorry- I clearly should have explained the Dust Bowl in more detail instead of just assuming people knew what it was! I've never heard of this title. I do know what you mean about the issues of repetition in audio books -- things I would just skim in print I feel kind of trapped by in audio. Still, sounds like it was at least worthwhile! Yes, and it's hard to know how to thumb forward without missing out on something. Skimming via audiobook is very hard! I read this for a book group a couple of months ago, I didn't even know there was an audiobook version. I thought it extremely well written, though it's probably the most depressing book I've ever read -- I had to stop several times because it made me cry, it was so sad. I still haven't posted anything about it. Yes, it's very, very sad. I probably would have cried more, too, if I hadn't been listening to it on my way to work half-asleep and annoyed with the narrator. There's a show coming up this fall - November 18 -on PBS about it. I think it is going to give that human touch that you wanted more of in the book. I just read this one last year and had a similar experience. I enjoyed learning about it, but it did get repetitive.